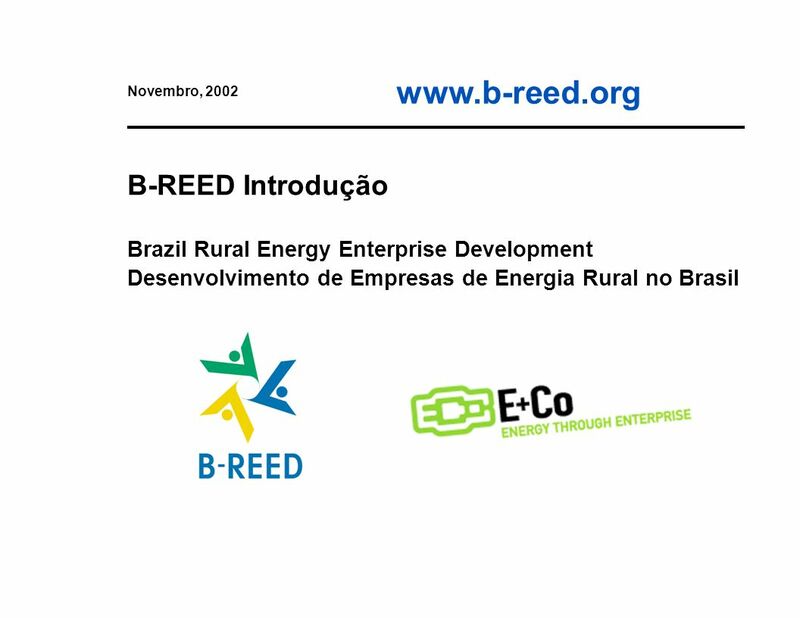 Novembro, 2002 B-REED Introdução Brazil Rural Energy Enterprise Development Desenvolvimento de Empresas de Energia Rural no Brasil. 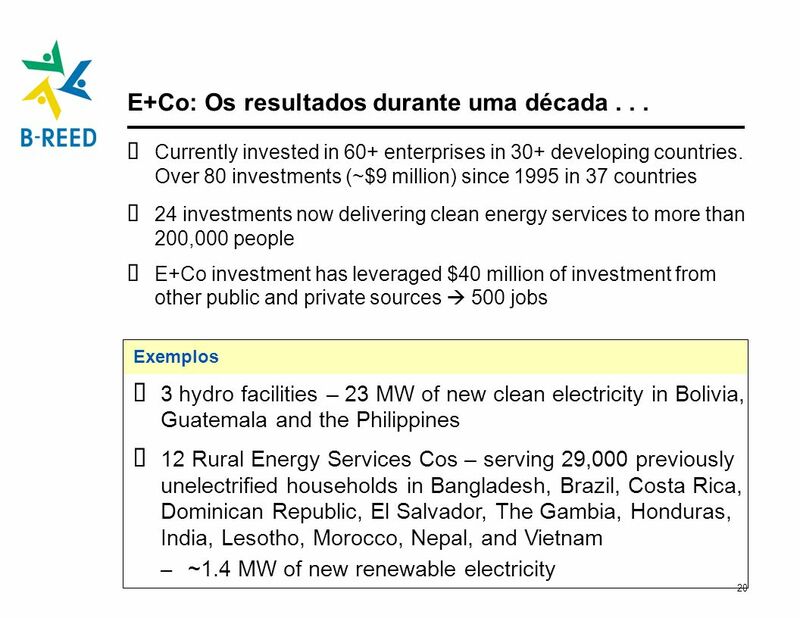 20 E+Co: Os resultados durante uma década . . .
22 Os resultados . . .
Soluz Honduras S.A. de C.V (“Soluz Honduras”) is a Honduran corporation and a majority-owned subsidiary of SOLUZ Inc. Soluz Honduras began operations in 1998, seeking to leverage experience gaining from the operations of Soluz Dominicana, which began operating in 1995. It is a pioneer in the implementation o rural photovoltaic (PV) solar home system (SHS) delivery through the rental (“fee for service” model) of different-sized PV SHS systems. 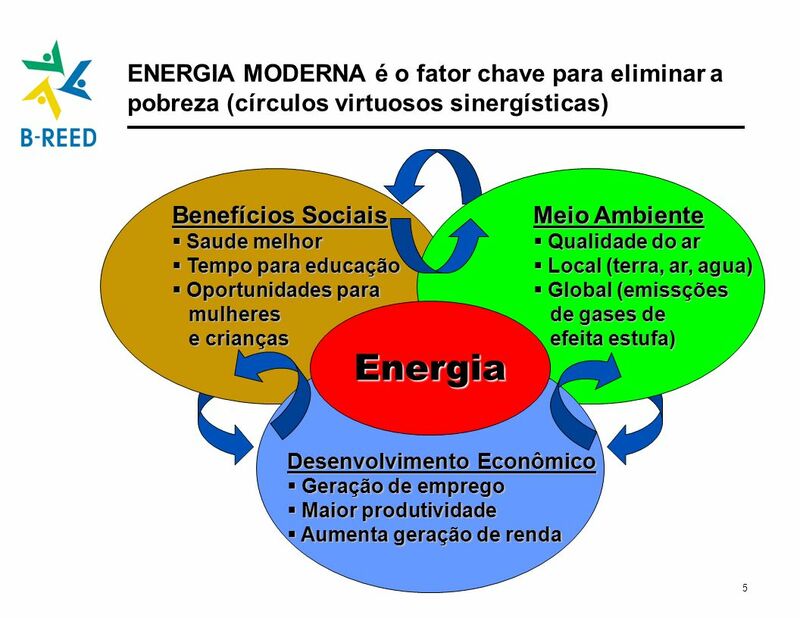 By maintaining ownership of the systems, Soluz is able to provide energy at affordable monthly rents and deliver its product to a greater penetration of the population. These prices are equivalent to what villagers would pay for kerosene, dry cell batteries, or recharging car batteries for TV usage. 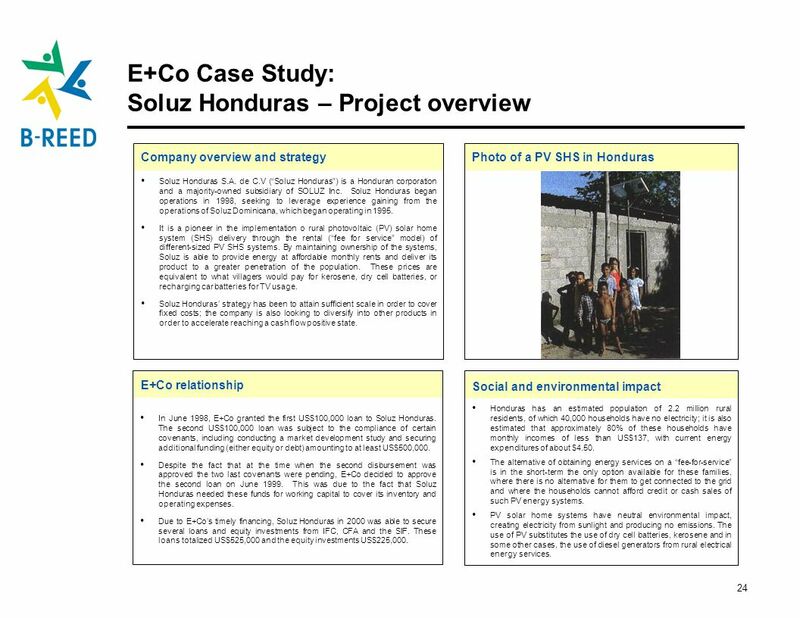 Soluz Honduras’ strategy has been to attain sufficient scale in order to cover fixed costs; the company is also looking to diversify into other products in order to accelerate reaching a cash flow positive state. Company overview and strategy Photo of a PV SHS in Honduras In June 1998, E+Co granted the first US$100,000 loan to Soluz Honduras. 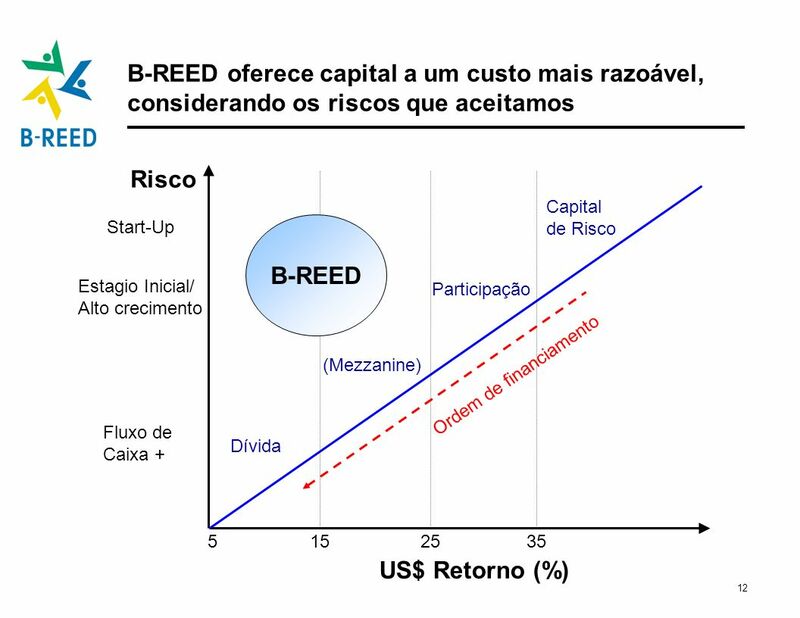 The second US$100,000 loan was subject to the compliance of certain covenants, including conducting a market development study and securing additional funding (either equity or debt) amounting to at least US$500,000. 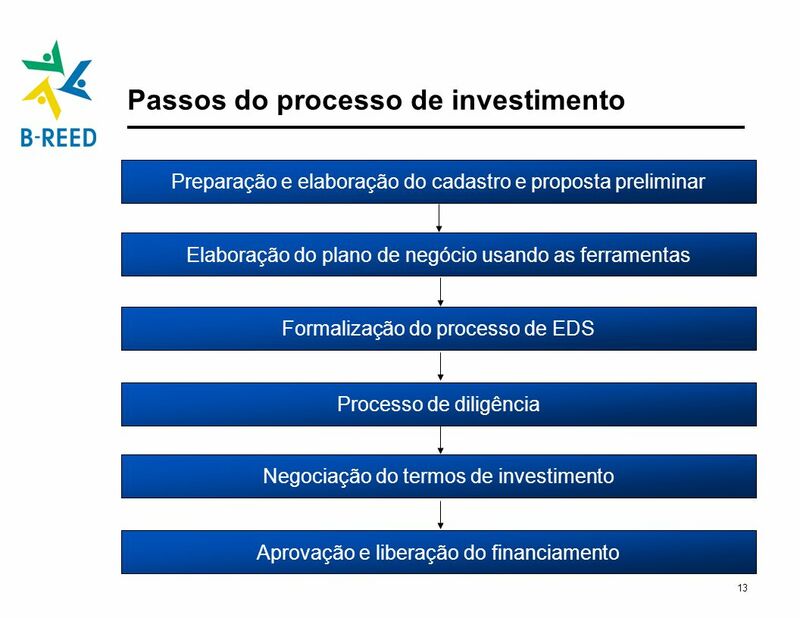 Despite the fact that at the time when the second disbursement was approved the two last covenants were pending, E+Co decided to approve the second loan on June This was due to the fact that Soluz Honduras needed these funds for working capital to cover its inventory and operating expenses. Due to E+Co’s timely financing, Soluz Honduras in 2000 was able to secure several loans and equity investments from IFC, CFA and the SIF. 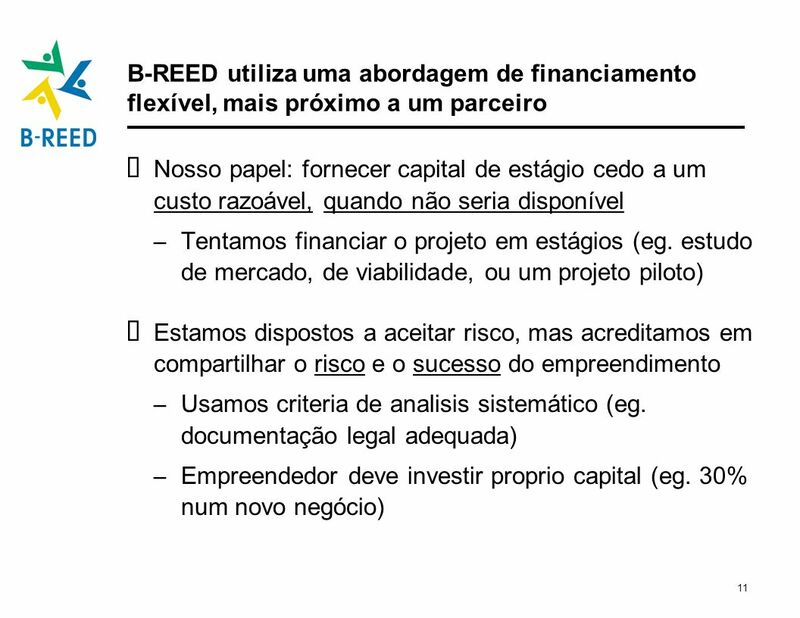 These loans totalized US$525,000 and the equity investments US$225,000. 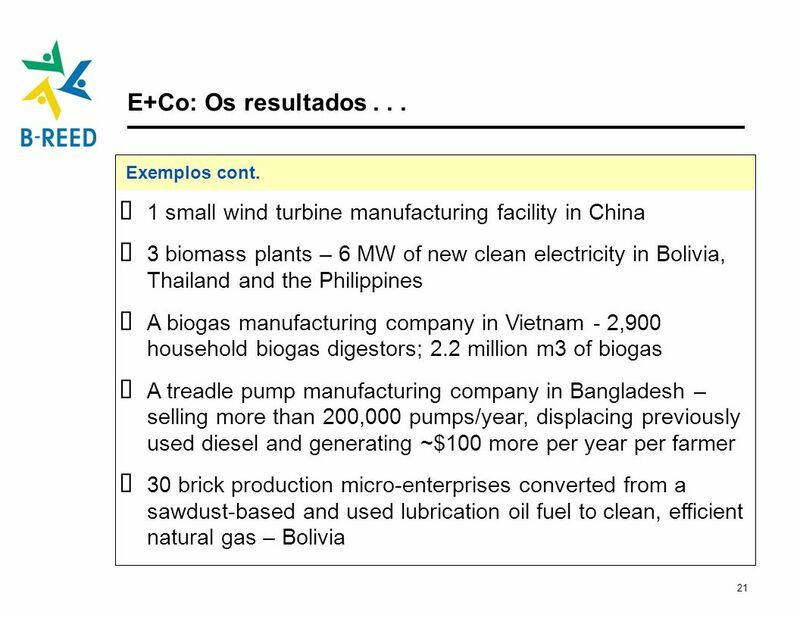 E+Co relationship Social and environmental impact Honduras has an estimated population of 2.2 million rural residents, of which 40,000 households have no electricity; it is also estimated that approximately 80% of these households have monthly incomes of less than US$137, with current energy expenditures of about $4.50. 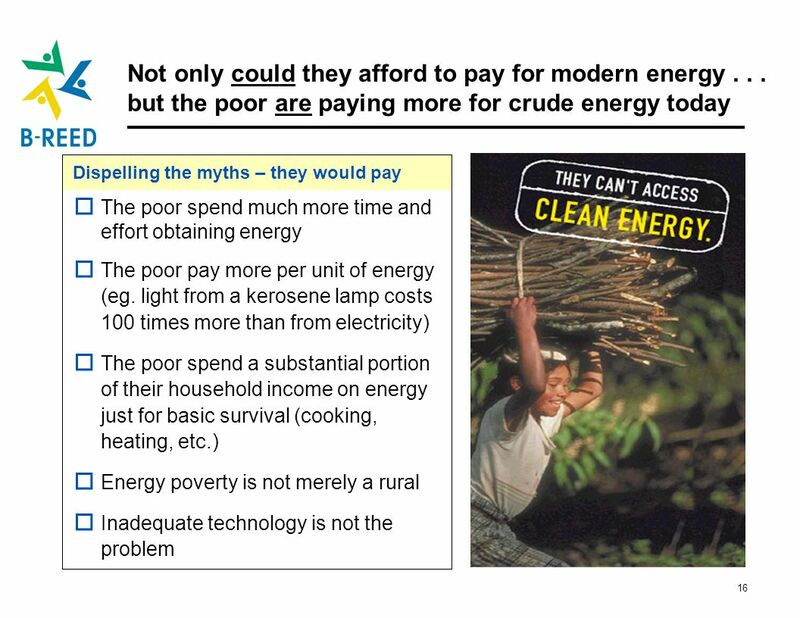 The alternative of obtaining energy services on a “fee-for-service” is in the short-term the only option available for these families, where there is no alternative for them to get connected to the grid and where the households cannot afford credit or cash sales of such PV energy systems. PV solar home systems have neutral environmental impact, creating electricity from sunlight and producing no emissions. The use of PV substitutes the use of dry cell batteries, kerosene and in some other cases, the use of diesel generators from rural electrical energy services. 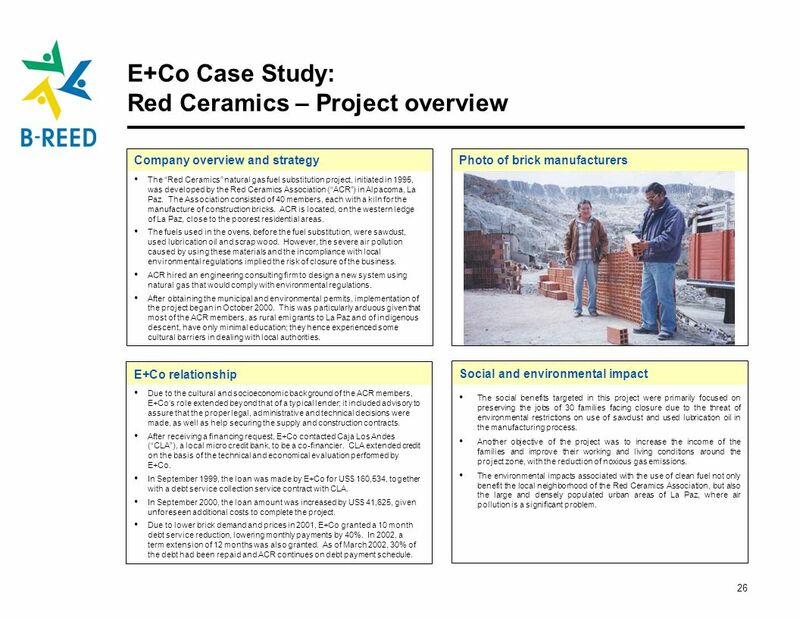 The “Red Ceramics” natural gas fuel substitution project, initiated in 1995, was developed by the Red Ceramics Association (“ACR”) in Alpacoma, La Paz. The Association consisted of 40 members, each with a kiln for the manufacture of construction bricks. ACR is located, on the western ledge of La Paz, close to the poorest residential areas. The fuels used in the ovens, before the fuel substitution, were sawdust, used lubrication oil and scrap wood. However, the severe air pollution caused by using these materials and the incompliance with local environmental regulations implied the risk of closure of the business. ACR hired an engineering consulting firm to design a new system using natural gas that would comply with environmental regulations. After obtaining the municipal and environmental permits, implementation of the project began in October This was particularly arduous given that most of the ACR members, as rural emigrants to La Paz and of indigenous descent, have only minimal education; they hence experienced some cultural barriers in dealing with local authorities. 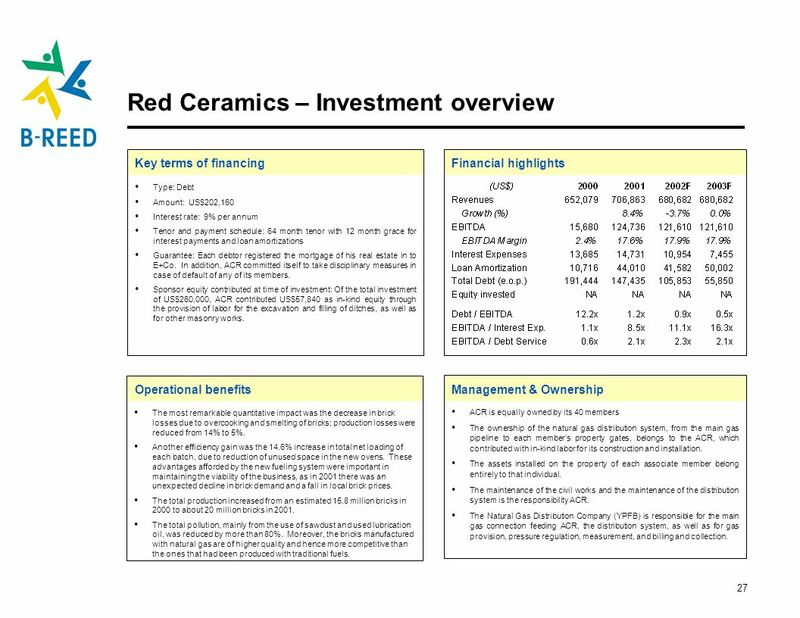 Company overview and strategy Photo of brick manufacturers Due to the cultural and socioeconomic background of the ACR members, E+Co’s role extended beyond that of a typical lender; it included advisory to assure that the proper legal, administrative and technical decisions were made, as well as help securing the supply and construction contracts. 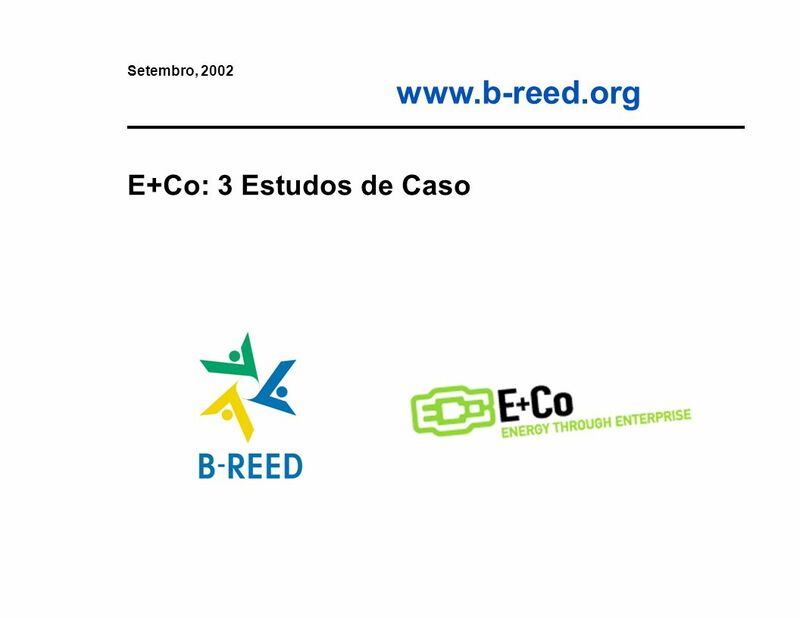 After receiving a financing request, E+Co contacted Caja Los Andes (“CLA”), a local micro credit bank, to be a co-financier. 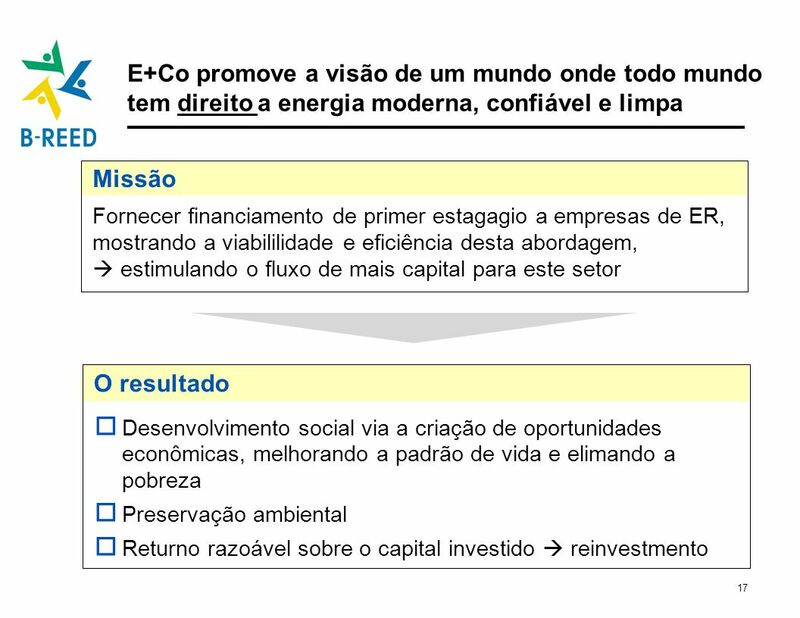 CLA extended credit on the basis of the technical and economical evaluation performed by E+Co. 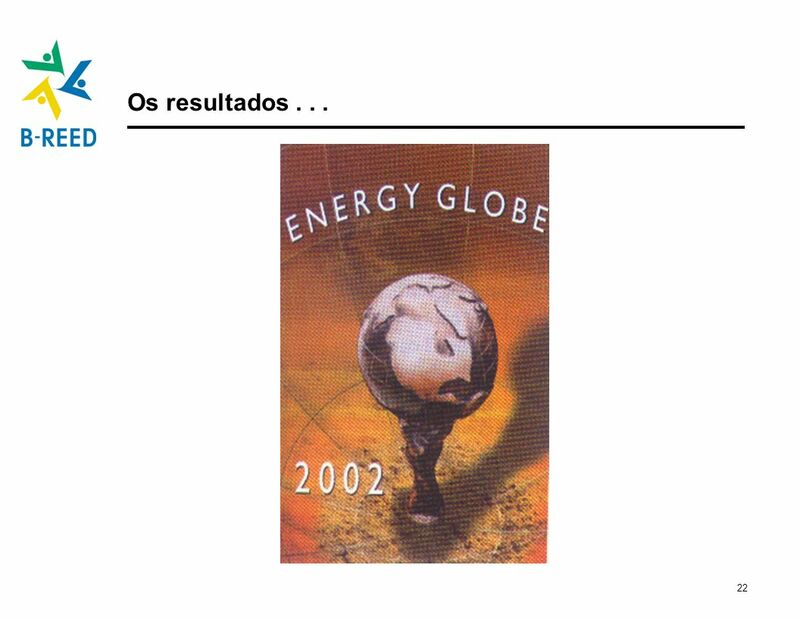 In September 1999, the loan was made by E+Co for US$ 160,534, together with a debt service collection service contract with CLA. In September 2000, the loan amount was increased by US$ 41,625, given unforeseen additional costs to complete the project. Due to lower brick demand and prices in 2001, E+Co granted a 10 month debt service reduction, lowering monthly payments by 40%. In 2002, a term extension of 12 months was also granted. As of March 2002, 30% of the debt had been repaid and ACR continues on debt payment schedule. E+Co relationship Social and environmental impact The social benefits targeted in this project were primarily focused on preserving the jobs of 30 families facing closure due to the threat of environmental restrictions on use of sawdust and used lubrication oil in the manufacturing process. 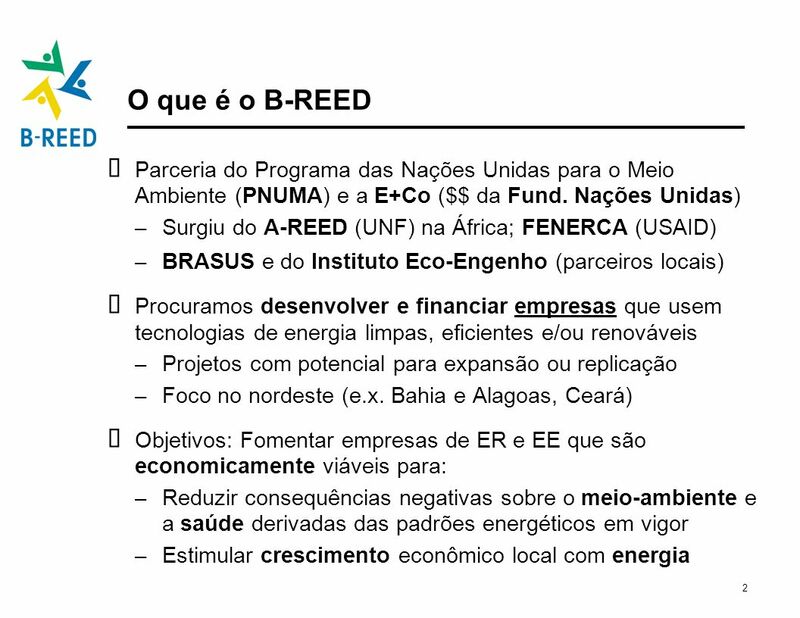 Another objective of the project was to increase the income of the families and improve their working and living conditions around the project zone, with the reduction of noxious gas emissions. The environmental impacts associated with the use of clean fuel not only benefit the local neighborhood of the Red Ceramics Association, but also the large and densely populated urban areas of La Paz, where air pollution is a significant problem. Type: Debt Amount: US$202,160 Interest rate: 9% per annum Tenor and payment schedule: 64 month tenor with 12 month grace for interest payments and loan amortizations Guarantee: Each debtor registered the mortgage of his real estate in to E+Co. 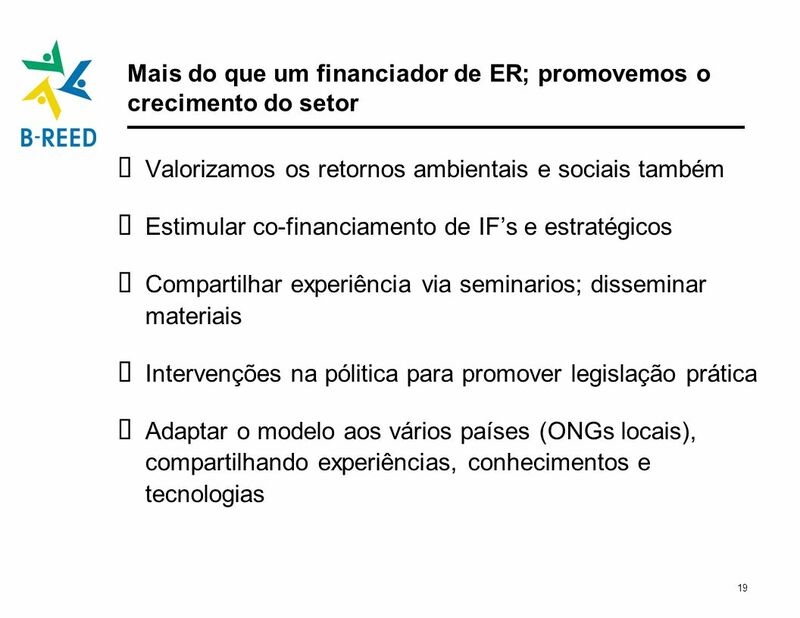 In addition, ACR committed itself to take disciplinary measures in case of default of any of its members. 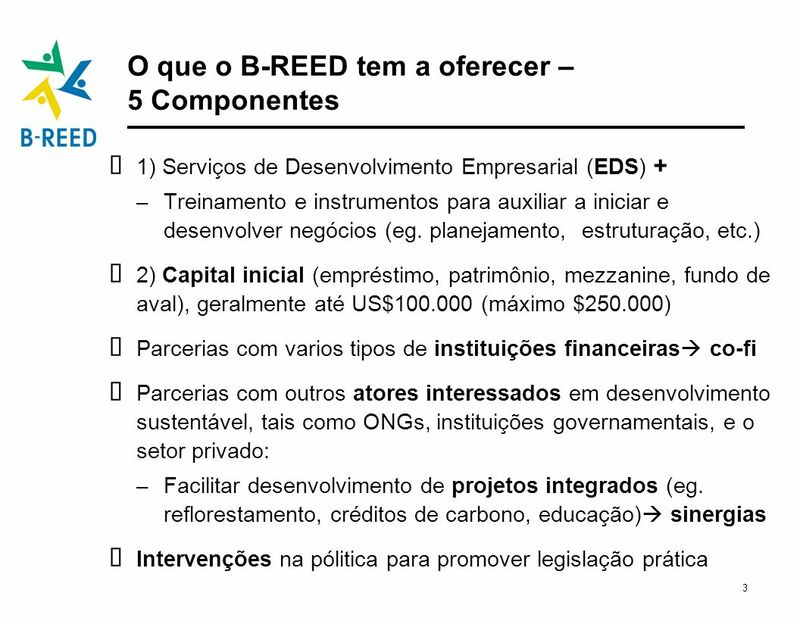 Sponsor equity contributed at time of investment: Of the total investment of US$260,000, ACR contributed US$57,840 as in-kind equity through the provision of labor for the excavation and filling of ditches, as well as for other masonry works. 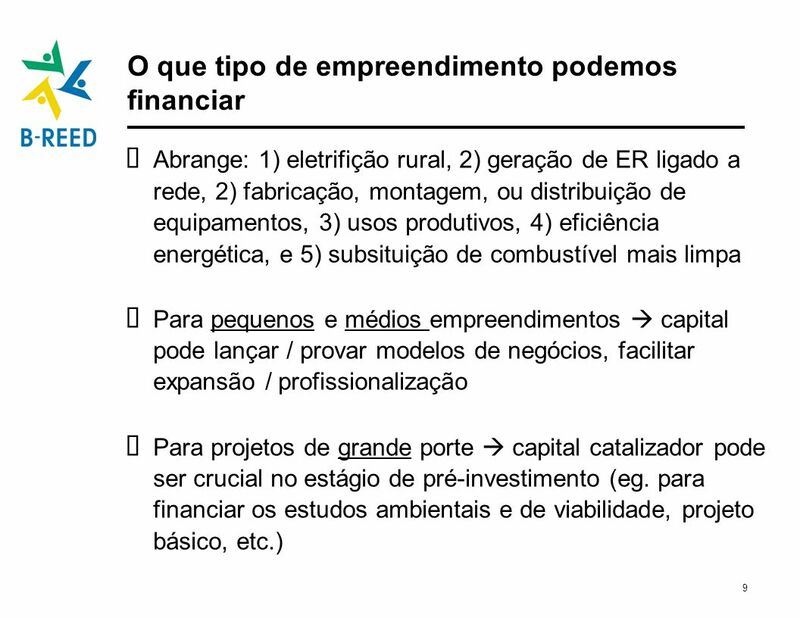 Key terms of financing Financial highlights The most remarkable quantitative impact was the decrease in brick losses due to overcooking and smelting of bricks; production losses were reduced from 14% to 5%. Another efficiency gain was the 14.6% increase in total net loading of each batch, due to reduction of unused space in the new ovens. These advantages afforded by the new fueling system were important in maintaining the viability of the business, as in 2001 there was an unexpected decline in brick demand and a fall in local brick prices. The total production increased from an estimated 15.8 million bricks in 2000 to about 20 million bricks in 2001. The total pollution, mainly from the use of sawdust and used lubrication oil, was reduced by more than 80%. Moreover, the bricks manufactured with natural gas are of higher quality and hence more competitive than the ones that had been produced with traditional fuels. Operational benefits Management & Ownership ACR is equally owned by its 40 members The ownership of the natural gas distribution system, from the main gas pipeline to each member’s property gates, belongs to the ACR, which contributed with in-kind labor for its construction and installation. The assets installed on the property of each associate member belong entirely to that individual. 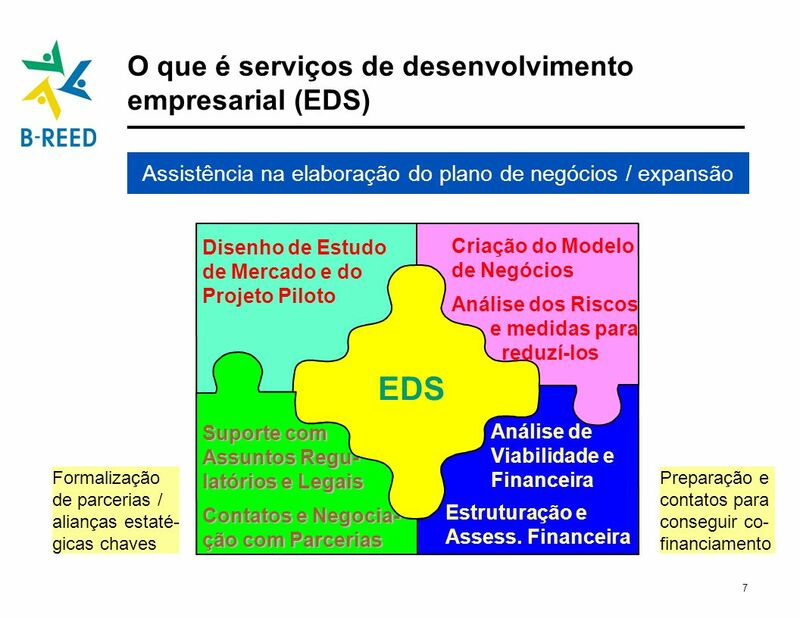 The maintenance of the civil works and the maintenance of the distribution system is the responsibility ACR. The Natural Gas Distribution Company (YPFB) is responsible for the main gas connection feeding ACR, the distribution system, as well as for gas provision, pressure regulation, measurement, and billing and collection. In 1993, SYNERGIA S.R.L., a small Bolivian company, was founded to develop a 7.5 MW hydropower plant, using an existing water supply reservoir located at an altitude of 4,350m on a mountain watershed above the historic town of Cochabamba on the edge of Lake Titicaca. For over 40 years, these waters had been channeled through an open canal to a reservoir located at the mountain pass and, from there, to the bottom of the mountain through a gully along 7.5 km. However, this existing viaduct system resulted in water losses of about 30% (about 2.38 million m3), hence limiting the potable water supply of the town. 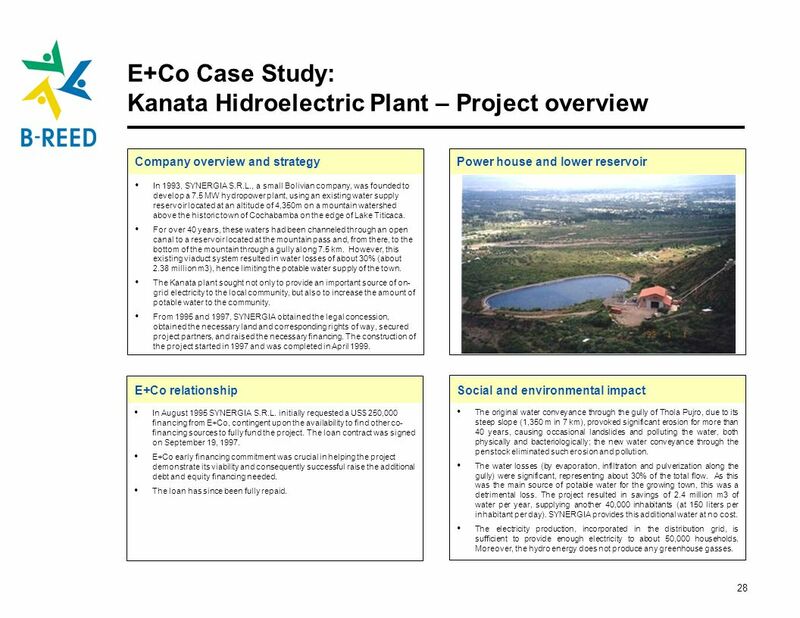 The Kanata plant sought not only to provide an important source of on-grid electricity to the local community, but also to increase the amount of potable water to the community. From 1995 and 1997, SYNERGIA obtained the legal concession, obtained the necessary land and corresponding rights of way, secured project partners, and raised the necessary financing. The construction of the project started in 1997 and was completed in April 1999. 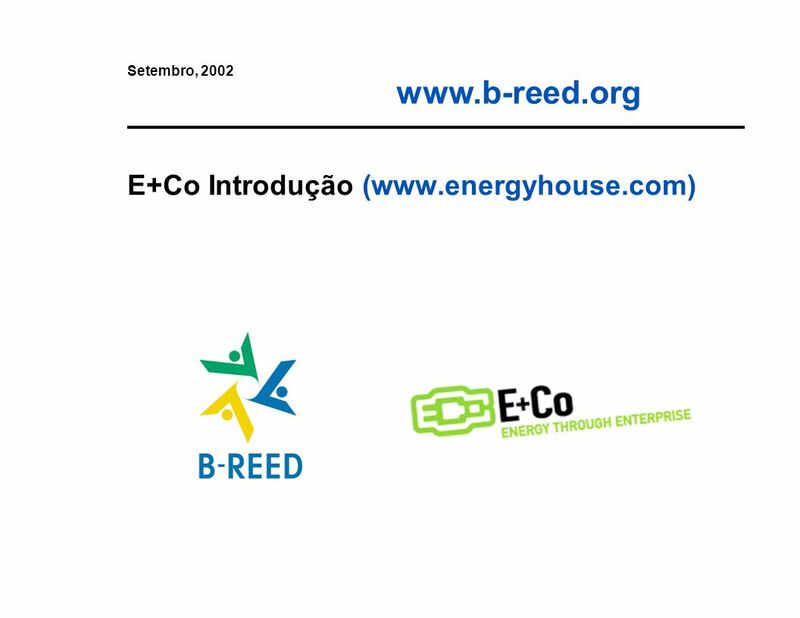 Company overview and strategy Power house and lower reservoir In August 1995 SYNERGIA S.R.L. initially requested a US$ 250,000 financing from E+Co, contingent upon the availability to find other co-financing sources to fully fund the project. The loan contract was signed on September 19, 1997. 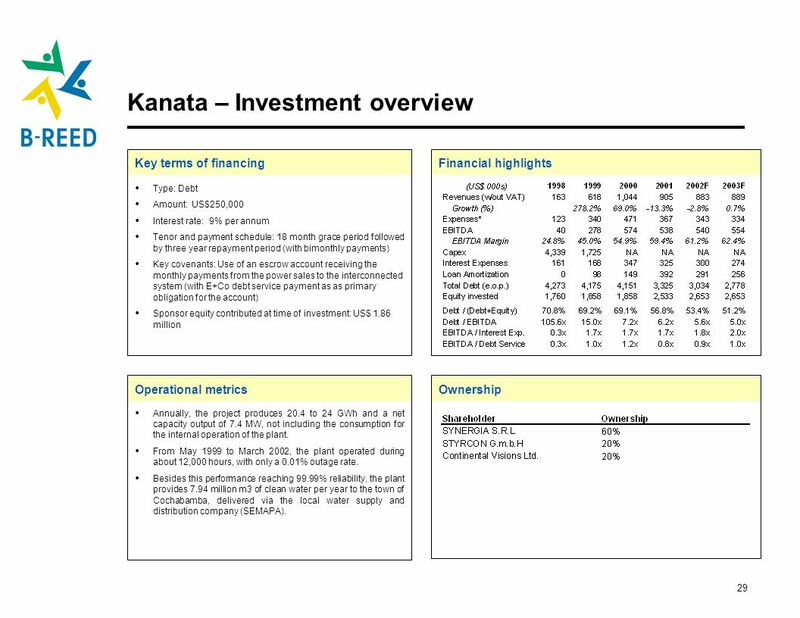 E+Co early financing commitment was crucial in helping the project demonstrate its viability and consequently successful raise the additional debt and equity financing needed. The loan has since been fully repaid. E+Co relationship Social and environmental impact The original water conveyance through the gully of Thola Pujro, due to its steep slope (1,350 m in 7 km), provoked significant erosion for more than 40 years, causing occasional landslides and polluting the water, both physically and bacteriologically; the new water conveyance through the penstock eliminated such erosion and pollution. The water losses (by evaporation, infiltration and pulverization along the gully) were significant, representing about 30% of the total flow. As this was the main source of potable water for the growing town, this was a detrimental loss. The project resulted in savings of 2.4 million m3 of water per year, supplying another 40,000 inhabitants (at 150 liters per inhabitant per day). SYNERGIA provides this additional water at no cost. The electricity production, incorporated in the distribution grid, is sufficient to provide enough electricity to about 50,000 households. 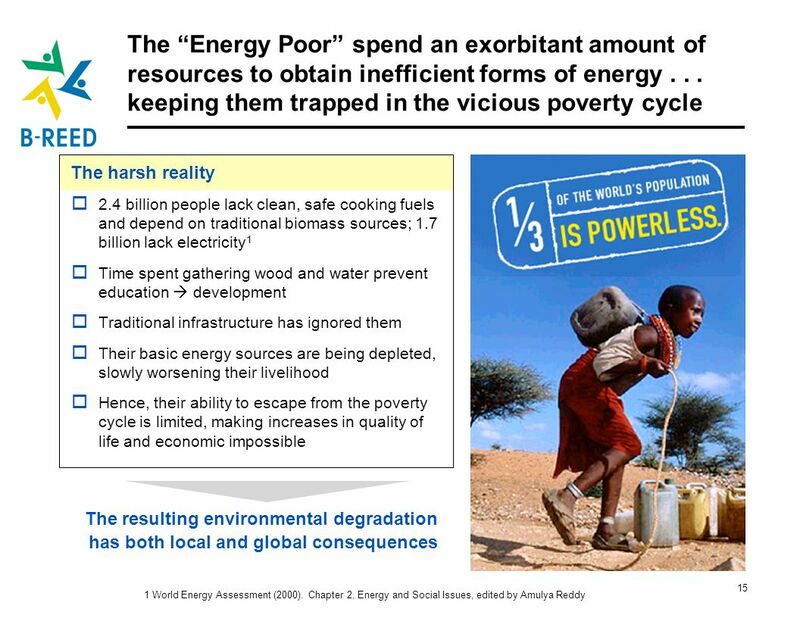 Moreover, the hydro energy does not produce any greenhouse gasses. 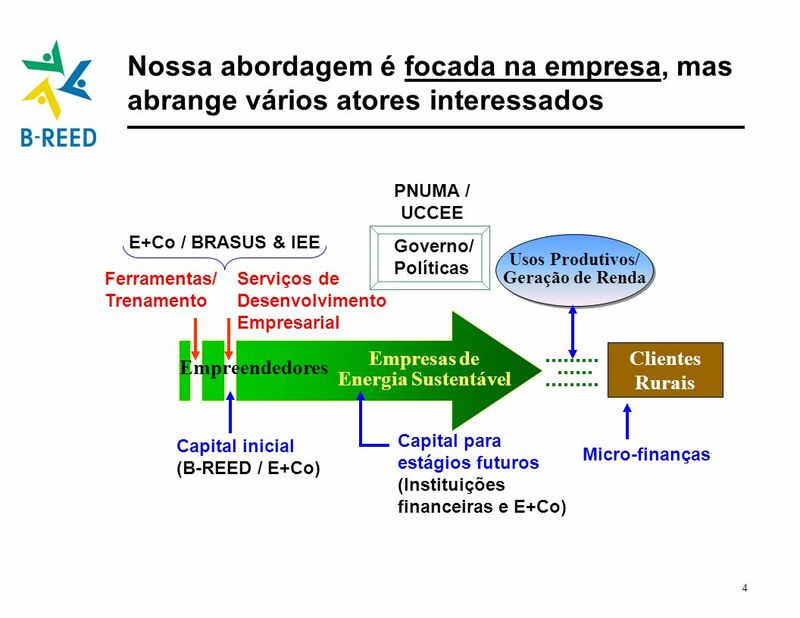 Carregar ppt "Novembro, 2002 B-REED Introdução Brazil Rural Energy Enterprise Development Desenvolvimento de Empresas de Energia Rural no Brasil." 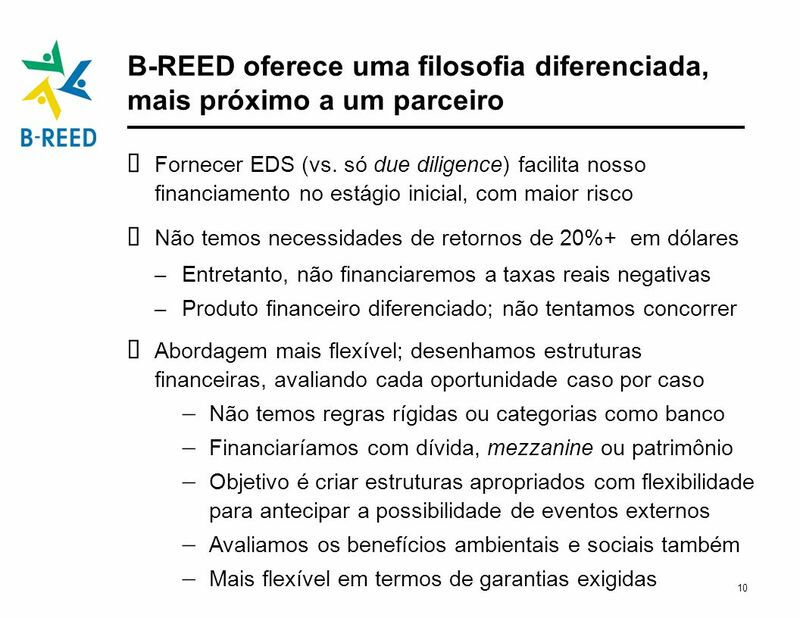 Influência da dieta e da amamentação na variação de peso pós-gestacional Rosely Sichieri Instituto de Medicina Social-UERJ, Rio de Janeiro, Brasil sichieri@ims.uerj.br.